(TNS)—Q: My neighbor’s large, seemingly dead tree overhangs my screened-in pool and has long made me nervous. I have repeatedly asked her to remove it. She always ignored or rejected my requests. During a hurricane, the tree finally came down, like I knew it would, and damaged my pool cage and house. The damage, while expensive, was less than my insurance deductible. Can I get my neighbor to pay for the damage? A: The rules regarding neighbors’ trees that overhang or intrude on your property are long settled and have been discussed in this space before: If a branch or root extends on your property, you may trim the tree back to the property line but may not kill or unnecessarily damage the tree. If you do not take the opportunity to do this, and your property is damaged as a result, you would bear the repair costs. The concept is, simply stated, that it is better to let you protect your own property in a reasonable way, then subject your neighbors to the burden—and the public to the numerous lawsuits that would ensue if the rule were any different. However, your situation was not typical since the tree may have been dead and you had repeatedly warned your neighbor of the problem it could cause. In determining whether you can seek reimbursement from your neighbor, the health of the fallen tree should be considered. 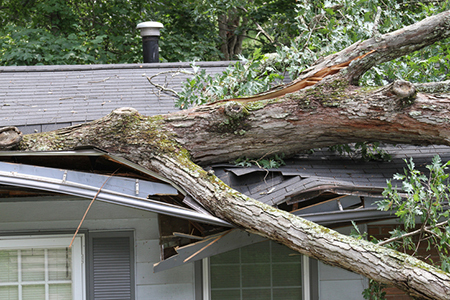 If the tree was dead, and your neighbor knew it could cause a problem, she can be held responsible for the repairs in court. Generally speaking, when a neighbor’s living tree falls on your house, you need to make your own repairs—but if the tree is dead, then your neighbor is on the hook.